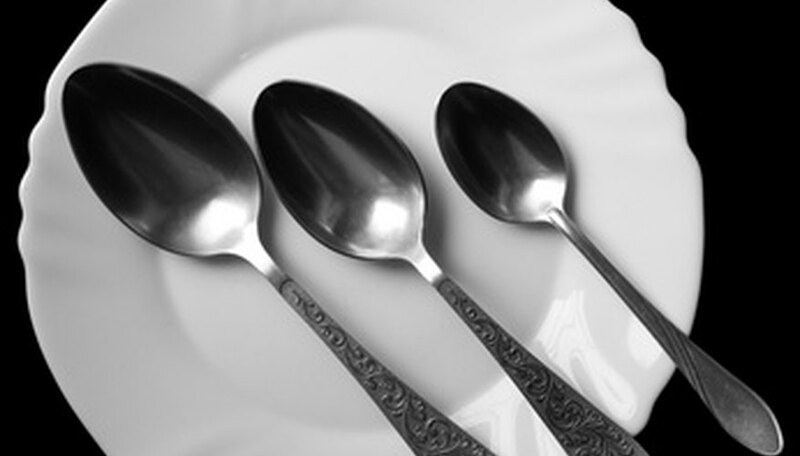 All types of forks and spoons used in dining are referred to as flatware. Sterling flatware is made from a 92.5 percent pure grade of silver. Although silver plate flatware might look similar to sterling items at first sight, their value is far less because of the lower percentage of silver. Values for sterling flatware vary widely, but a few key areas reliably affect prices and demand. Maker and date play a big part in sterling silver flatware valuation. Older items by respected manufacturers often reach the highest sale prices. Symbols, known as hallmarks, stamped in the surface of the silver help determine maker and date. Look for hallmarks on the back of flatware stems. Flatware items marked with the stamp "925" or "Sterling" are made from sterling silver, though other international hallmarks also can represent sterling. Look up hallmarks online at the 925-1000 website, or consult a specialist hallmark guidebook. As a general rule, the better the condition of the flatware, the higher the value. Of course, some general wear is expected on antique sterling flatware. Flatware was designed to be used, after all. Fork tines may be blunt and spoon rims can become worn. Flatware that makes up a full dining set, or forks and spoons by the same maker grouped together will often attract higher prices from collectors. Fashions fall in and out of favor. Sterling flatware design also goes through phases of demand. Though antiques will usually outsell modern items, some recent styles currently might be in vogue. For example, the straight lines and edges of art deco flatware from the early 20th century is a popular style in 2010. Some ornate 19th designs are less in demand. The provenance of a flatware item can increase its value. Provenance refers to the origin of the object, with verifiable proof of its history. For example, a spoon might have been passed down through successive generations, traceable back to a significant person from history. Wills, letters, contracts or receipts are usually required to back up any claims. Auction houses often sell sterling flatware as part of specialist silver sales. Larger auction houses might display their final sale prices on their websites. Checking these prices is a good indication of current demand and general flatware value. Similarly, guides such as the Miller's Antiques and Collectibles website offer estimates on value and popularity. As with all collectibles, prices can fluctuate.